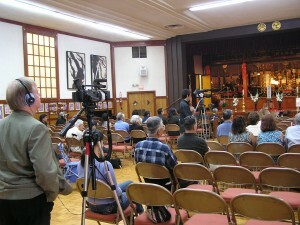 Aug. 1—The American Society of Hiroshima-Nagasaki A-Bomb Survivors Memorial Service will be held on August 1, 2010 at: 2:00pm – 3:00pm at Koyasan Buddhist Temple (342 East First Street, Los Angeles, CA 90012). The annual service is held to remember the victims who died and to support those who survived the atomic bomb blasts over Hiroshima and Nagasaki 65 years ago. Special guest speaker will be Darrell Miho, a photographer and writer, who is documenting the stories of the hibakusha (atomic bomb survivors) to create a traveling exhibit to educate future generations of the devastating affects nuclear weapons have on people’s lives and to spread the hibakusha’s message and their hope for peace.